The name John Gunion Rutherford strikes few chords of recognition among Manitobans, yet the Portage la Prairie veterinarian was hailed in his lifetime as one of Canada’s greatest agriculturalists. At the height of his career Rutherford played a key role in the elimination of animal disease and in the establishment of federal meat inspection. Hard work and professional dedication enabled this well-educated young man to achieve success in his first years in the keystone province. His veterinary facility was described by the Nor’West Farmer as “a decided step in advance for Manitoba, many of its conveniences being hitherto unknown here.” Rutherford participated in a number of activities unrelated to his practice but well within the confines of his profession. As a columnist for a leading Winnipeg agricultural periodical he wrote weekly articles on such divetse topics as farm animal diseases, horse breeding, animal wintering, and stable hygiene. One of the founders of the Manitoba Veterinary Association, he held the posts of secretary and registrar for a number of years. Locally his name appeared on the executive of the Portage and Lakeside Agricultural Society and Farmers’ Institute. But no matter how time consuming and personally rewarding these activities may have been, they did not pose the challenge that this restless individual desired. Politics constituted the next step in Rutherford’s career. In 1892 he secured election to the provincial assembly as a Lakeside Liberal, and held the seat four years. This was followed by a brief stint as a federal Liberal Member of Parliament for Macdonald. In the capacity of M.L.A. Rutherford quickly established himself as a proponent for far-reaching reform. In his first address in the 1893 legislature he proposed that the Manitoba Government appoint a dairy inspector with power to insure creamery cleanliness and milk purity. Two years later Rutherford suggested that the province begin construction of a comprehensive road network. Derided for being impractical and far ahead of his time he sought solace in a Parliamentary seat. As a backbencher during Laurier’s heyday Rutherford accomplished even less. The stringencies of party discipline blunted his effectiveness as a spokesman for change and led to his departure from public life. 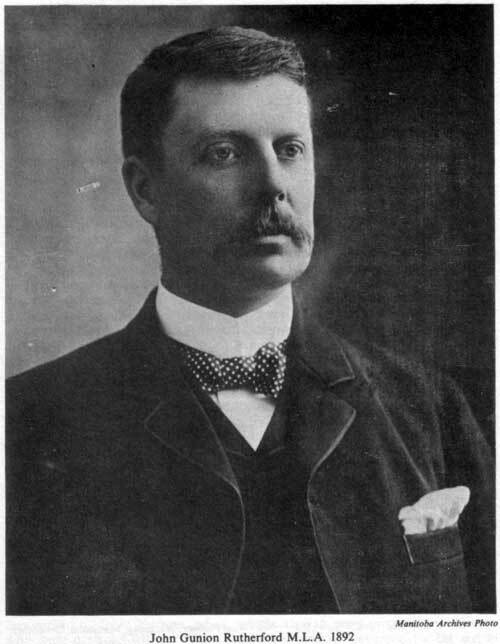 Rutherford’s appointment as Dominion Veterinary Director-General in 1902 and then Dominion Livestock Commissioner in 1906  marked the beginning of his career’s most creative phase. Civil service security provided him with the opportunity for developing systems of animal quarantine and meat inspection. One responsibility of the new Veterinary Director-General lay in organizing a Health of Animals Branch. Rutherford viewed the objective of the new Department of Agriculture sub-division as that of providing comprehensive nation-wide animal inspection and quarantine service. With few precedents to follow, his task became one of innovation. Prior to his appointment animal inspection “was an unknown, and in fact, unknowable quantity.” Although legislation outlining quarantine and inspection measures had been placed in the statute books, no enforcement agency had been established. Rutherford reversed the situation. Stations arose at seaboard ports and along the Canada-U.S.A. boundary to provide quarantine services. Qualified inspectors received mandates to administer these posts. The ramifications of this comprehensive system of livestock quarantine were far-reaching. Canadian livestock no longer succumbed to imported ailments. Local or regional disease outbreaks could be dealt with by provincial authorities. 1. “Mr. J. G. Rutherford, V.S., M.P.P.”, Nor’West Farmer, Winnipeg, Manitoba, December 1892, p. 325. 3. Arnott J. Magurn ed., The Parliamentary Guide, 1898-9, (Winnipeg: Manitoba Free Press Company, 1898), p. 77. 4. B. M. Greene ed.. Who’s Who in Canada, 1922, (Toronto: International Press, 1922), p. 312. 5. “The Address in Reply”, Manitoba Free Press, Winnipeg, Manitoba, 7 February 1893. Henceforth MFP. 6. “Mending the Waves”, MFP, 21 February 1894. 7. B. M. Greene ed., Who’s Who in Canada, 1922, p. 312. 8. “An Appreciation of Dr. J. G. Rutherford,” Nor’West Farmer, 20 July 1911, p. 911. 10. Obituary in Toronto Globe, 25 July 1923. John Gunion Rutherford File, University of Toronto Archives, Toronto, Ontario.